J2Store offers you to set advanced pricing for your product.This functionality enables you to have prices based on the quantity and date range. The following steps will guide you on how to set advanced pricing for your product. Create a new article and save the article . Navigate to J2store->Pricing.Enter the regular price. Click on Set Prices to set advanced pricing. A pop-up screen will open with fields such as Date range , Quantity range, customer group and price. 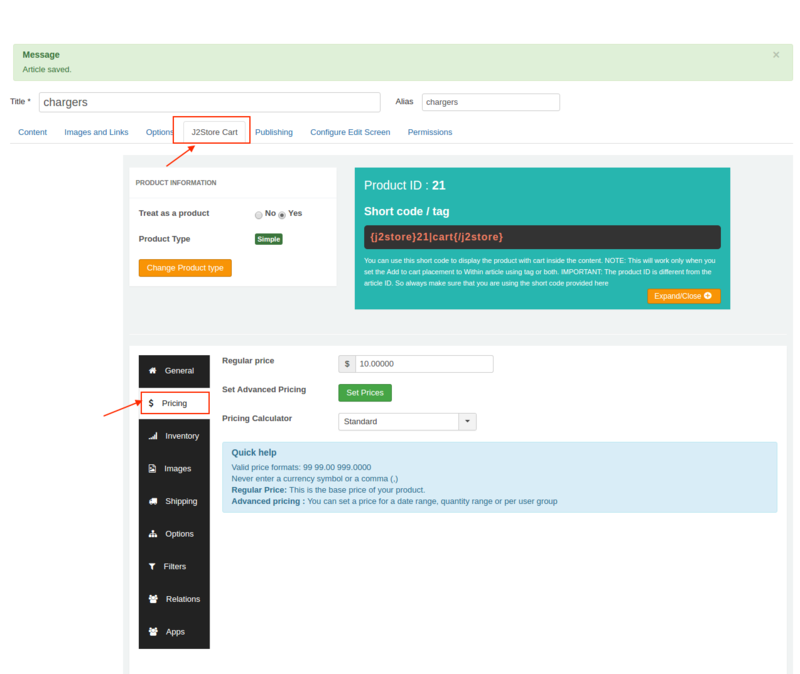 Navigate to your product article ->J2Store cart tab ->pricing->Set advanced pricing->mention the date range in the Date range(optional) field, set the discounted rate and click create. So when users buy this product, within the above mentioned date range, they would receive the discount mentioned. This option might be useful when you are trying to set up quantity range based discounts on your products. With the above setup, when user buys 2 and more quantities of the given product, they would receive each quantity in 10$. When you wish to offer customer-group based pricing, then you could choose the customer groups in the customer group option and set the price accordingly. So, with the above advanced pricing set up, users of the group Wholesale receive discount for the product. Enter the values in the required fields and click on the create button . A pop-up message price saved successfully will appear and the value entered will be displayed. you can create as many number of advanced pricing sets as per the requirement. You could also combine all the conditions such as date range, user group specific and quantity range to offer discounts for your products.